Ever heard of the Fitzpatrick scale? Developed in the 70s by a famous dermatologist, but still used to this day, it’s a numerical way to classify different skin colours. It lists six different types that range from 1 (very pale) to 6 (very dark). If you’re a type 4 to 5, you’ll know that the skin concerns you face are pretty unique to those of lighter skinned people. Just three that you’re be more prone to, for example, are hyperpigmentation, dermatosis papulosa nigra and ingrown hairs. Fortunately, at Skin Renewal, you’ll find highly skilled doctors and therapists who know that there isn’t a ‘one size fits all’ solution for every skin colour, as well as an array of treatments best suited to those with a darker skin tone. Pigmentation and the dark marks left behind from acne are the bane of life. The challenge is to fade said marks, referred to as post-inflammatory hyperpigmentation (PIH), without causing further irritation that can actually make them worse. Ugh! PIH is often treated with prescription hydroquinone-based products but if the marks are stubborn (and they often are!) you’ll require the ‘big guns’ in the form of laser treatment. There was a time when it was difficult to find lasers that worked on darker skin tones, but fortunately new innovations in tech have produced machines like Laser Genesis and Fraxel Dual that work for everyone. Skin Renewal has both machines in their artillery and has used them with great success to minimise – if not completely clear – pigmentation on darker skin. Another way you can treat pigmentation in-office is via a series of peels; an intravenous infusion containing brightening antioxidants and transdermal mesotherapy. The latter is a machine that uses electrical pulses and vibrations to transfer topical products like serums specifically formulated to improve pigmentation into the deeper layers of your skin. It’s a great ‘add-on’ to a peel because, straight afterwards, your skin will be more receptive to whatever you apply to it. If you’re a fan of Morgan Freeman (who isn’t? ), you’ll have noticed he’s got dark brown papules just under his eyes. These are called dermatosis papulosa nigra (DPN), benign growths (seborrheic keratosis) that often occur in a cluster on the face and neck of those with darker skin. Often mistaken for moles or warts, these small, darker-coloured lesions can affect men and women and are caused by a combination of genetics, ageing and unprotected sun exposure. While they’re not cancerous, they can increase in number and size and many people choose to have them removed for cosmetic reasons. At Skin Renewal, we use a long pulsed Nd: YAG laser to get rid of them safely and painlessly. Initially, straight after the procedure, they might get a little darker, but these fade quickly if the skin is pre-treated with a skin-lightening agent, something we’ll help you do beforehand. Last but not least, if you’ve got a darker skin type, you’re more likely to have curly hair , and this increases your odds of ingrown hairs. While straight hair has an easier time exiting directly out of the follicle, curly hair tends to spiral back in on itself or grow sideways, making it more prone to getting stuck. Once ‘trapped’, an ingrown hair can cause inflammation and can progress to forming a pustule. While it’s tempting to attempt to free it with something like a tweezers, this can end up causing infection and scarring. Fortunately, if left alone, most inflamed ingrown hairs will heal on their own but if you don’t have the patience to have to deal with it then consider laser hair removal. It’s a myth that darker skin types can’t benefit from laser hair removal. You simply need to use the correct machine on the right setting and, again, Skin Renewal’s long pulsed Nd: YAG laser can easily do the trick. 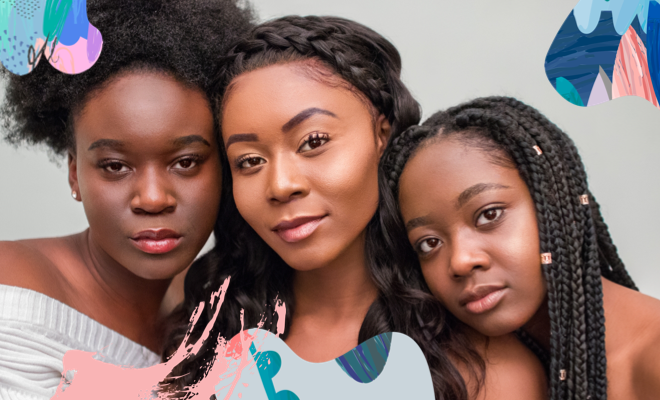 In short, with the right advice, proven products and cutting edge in-office treatments, addressing the problems that face those with darker skin is completely possible so get in touch with Skin Renewal today to create a beautiful, healthier-looking complexion. Got questions? We’ve got answers. Check us out on the ‘Ask the Experts‘ tab.